Bob King has an image problem on his hands. Not his own, but that of the union he now leads. Elected president of the United Auto Workers union on June 16, King must reintroduce the union to the American public, the majority of whom have an outdated perception of unionized labor. 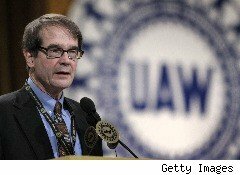 The public's lack of understanding is largely the fault of the UAW, which has done very little to help consumers understand the union, says Dave Cole, chairman of the Center for Automotive Research in Ann Arbor, Mich. "The UAW is not loved by the general public, because they don't know them," Cole says. "Consequently, the UAW is really being defined by people outside the organization in many cases" -- and frequently unfavorably. King, 63, who replaced Ron Gettelfinger, is expected to work hard to develop a more popular image of the union. One of the reasons few Americans understand the UAW is that union workers, generally, comprise much less of the U.S. workforce. From a high of some 1.5 million members in 1979, the UAW's ranks have shrunk to less than a quarter of that number, to 355,000. Beyond remaking the union's image, King will push to raise the number of union members and seek to restore some of the concessions workers have given to U.S. automakers in recent years, which amount to $7,000 to $30,000 per worker during the past five years, King has said. The union surrendered raises, bonuses and cost-of-living adjustments at GM, Ford Motor (F) and Chrysler, Bloomberg News reported. It also agreed to a two-tier wage system, in which new hires earn about $14 an hour, half the amount paid to previously hired hourly production workers. Though economic recovery is helping to revive sales at the Big Three, the companies aren't likely to go on a hiring spree anytime soon. That means King will continue to pressure Toyota Motor (TM), Honda Motor (HMC) and other international auto makers and dealers to recognize the union, says Arthur Wheaton, auto-industry analyst at Cornell University. King, a former director of organizing for the UAW, "has a tremendous passion for organizing and will be much more aggressive and assertive than Gettelfinger," Wheaton says. He's already on the offensive. Earlier this month, King took Toyota President Akio Toyoda to task for a decision to shift production of its compact Corolla sedan to a new nonunion plant in Blue Springs, Miss., with the aim of starting production by late 2011. The move followed the closing of the New United Motor Manufacturing factory (known as Nummi) in Fremont, Calif., earlier this year. The plant, jointly run by GM and Toyota until GM declared bankruptcy, was the only factory where Toyota workers were represented by the UAW. "The only reason they closed that plant is because it was a UAW plant," King said at the UAW's constitutional convention in Detroit earlier this month. "Mr. Toyoda, if you care about safety and quality in America, you'll go back to Fremont and build Corollas there and not in Mississippi." Toyota defended ceasing production of the Corolla in Fremont, saying it was simply a matter of logistics and costs. "It was a long way from our suppliers and was getting engines made in West Virginia," Toyota spokesman Mike Gross told Bloomberg. "Nummi was not economically feasible." In addition, says Cole of the Center for Automotive Research, the Fremont plant, which Toyota sold to electric-car startup Tesla Motors in May for $42 million, was obsolete. Although King is expected to continue to "push very hard" on getting into the new Toyota plant, it won't be easy. Employees of international automakers, generally already earn on par what UAW members earn, Cole says. Further, the benefits package offered to Toyota workers is better than the one given to their counterparts at domestic companies. King will have to move fast to make his mark because he'll be too old to qualify for reelection to his post in four years, thanks to UAW bylaws stipulating the officers must retire upon reaching age 65. That presents both opportunities and dilemmas, says Cole. The new president doesn't have to worry about getting reelected, "while at the same time he could be viewed as a lame duck." Still, Cole believes King will be an effective leader. Whether the UAW is doing enough to groom the next generation of leaders remains to be seen. Still, King's tenure at the top will be judged by how much he can repair both the union's public image and its membership rolls.